Derry manager, Damian McErlain suffered his second successive league defeat in Longford. Derry slipped to a second Division Three defeat in two games after Michael Quinn's early second half goal proved the catalyst for an impressive Longford to make it four points from four at Glennon Brothers Pearse Park on Sunday. Neither side was able to seize the initiative in a tactical first half which saw Longford deservedly turn around two points in front after Enda Lynn's 31st minute goal brought Derry back into a game they had struggled to make an attacking impact upon until that point. Lynn's goal was the best move of the match and when half-time substitute James Kielt brought the deficit back to a single point within seconds of the restart, Derry looked well placed to push on. Then Quinn struck. The Emmet Ogs player was probably the stand out performer but he had plenty to do when he picked up possession outside the '45'. However, with Derry players standing off and probably expecting a pass, the midfielder went straight for the jugular, ghosting past four Oak Leaf defenders to plant a lovely left footed finish past debutante Oran Hartin for the game's crucial score. It left the Oak Leafers chasing the game and they never quite managed to bring themselves within distance again against a well organised Longford side set up perfectly to hit teams on the break. It means next week's visit of Offaly takes on even greater significance, both sides going into that game without a point and in danger of being cast adrift at the bottom of Division Three. There were positives for Derry. Hartin, Padraig McGrogan and Conor Doherty all showed up well and continue to develop. The result may be a setback but the new Derry management team went into the job with their eyes wide open, knowing full well decades of under achievement was never going to be remedied in an instant. 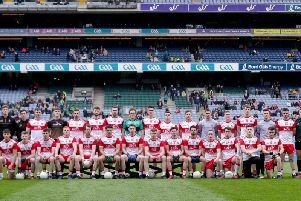 Both sides showed huge personnel changes from the last time the two sides met in Longford, the home side including only Billy Gilleran, Michael Quinn and Sean McCormack from a 2014 Round 1A All Ireland Qualifying clash in which Kevin Johnston, Emmet Bradley, Enda Lynn, Terenece O'Brien and Ciaran McFaul started for Derry with substitutes Mark Lynch and James Kielt also starting that June clash. Mindful of last week's opening against Westmeath which cost them two goals in three minutes, Derry were determined not to be caught cold a second week in succession with Lynn firing over the game's opening point. That score took only 20 seconds but it was far from the signal for an open game as the first 35 minutes saw play move mostly between the respective 45 lines, Derry especially struggling to break the resolute Longford defensive line. Indeed that Lynn point would be Derry's last until the same player netted and in between Longford showed what an under rated side they are with a controlled, counter attacking display that should have had them further in front. Even the loss of the influential SeanCormack to a nasty looking hamstring injury didn't curtail the home side as points from Connor Berry, Rian Brady (2), James McGivney, Daniel Mimnagh carried them to a 0-6 to 1-01 half-time lead. Lynn's goal though was a thing of beauty though. The Greenlough man started the move himself on the Longford 45m line. Bursting through, he fed Carlus McWilliams who in turn picked out Emmet Bradley. Bradley put a great ball into full forward Peter Hagan who returned the pass to Bradley but, all the while Lynn had continued his run and when Bradley squared across goal, Lynn had the simple task of finishing into an empty net. The goal probably flattered Derry's first half display although Niall Toner could have had an earlier goal when his speculative effort was misjudged by Longford keeper Paddy Collum and dropped down on the line with some Derry supporters claiming it had actually crossed the line. Still , Longford were worth their advantage but when Derry introduced Mark Lynch and James Kielt at half time and the latter pointed early, it looked set to be Derry's afternoon. Then Quinn stepped forward, established the Longford lead and four points to the good the managed the remainder of the game without ever looking in too much trouble. Derry battled to the end but against a side whose game-plan relies on getting in front and hitting on the break, it was never enough. They did have a couple of sniffs of goal, notably when Benny heron fisted a Ciaran MFaul high ball agonisingly wide of the far post with Collum beaten. Without a goal, Derry were never going to close the gap and Longford made them pay for pushing forward, stretching their lead to seven by the final whistle. that was harsh on Derry but the Oak Leafers know next's week's game now becomes 'must win' territory.